This aphid showed up on Chinese hackberry trees in Davis and other Sacramento Valley cities in 2002. First found in Florida and Georgia in the late 1990's, it has spread rapidly across the south and into California. The fuzzy white insects, which are found on the tops and bottoms of the leaves, cause the leaves to drip sticky liquid all over everything beneath them. This sugar excretion draws ants, and a black mold may grow on surfaces covered with it. Even very large populations of aphids don't seem to weaken or stress the trees, but the amount of sticky goop is a major nuisance. Products containing imidacloprid, a systemic insecticide, give effective control. The insecticide is mixed in a bucket of water and poured around the trunk, with another bucketful of water poured on top to water it in. Both materials will take several weeks to get into the plant and kill the aphids, so it is best to apply it early in the season. It travels up the tree at the rate of about one foot a day. Beneficial insects, especially lacewings and including ladybird beetles, do establish populations on infested trees, so some level of control may occur naturally. You can learn to recognize the distinctive eggs of lacewings, the larva and pupa stages of ladybird beetles ("ladybugs"), and leatherwing beetles. But don't expect them to eat enough aphids to completely prevent the sticky excretion. If you choose not to treat the trees, you'll likely have a sticky layer on the ground and surfaces under the trees from April through fall. What is the application method and rate? The drench is mixed in a bucket of water and poured around the trunk of the tree at the rate of 1 oz. per inch of circumference, measured at about your chest height on the tree. This is most easily measured with a soft measuring tape. But if for some reason you are estimating from the diameter, remember that circumference = 3.1416 x diameter. If your tree has multiple trunks, measure their circumferences, add them together, and multiply by 0.75. It may seem odd to just pour the systemic around the trunk of a large tree and expect it to get up into the leaves. But the tree has enough feeder roots there to absorb it. You can apply it further out in the drip line of the tree; it will take a little longer to get up to the leaves as it travels through the larger roots first. When should it be applied? It takes 30 - 45 days to get up into the tree, so March applications should get it there before the aphids get severe. It is soluble, so we're concerned that early applications followed by heavy rain, could move much of it out of the root zone. Treatments later in the season give adequate results, but you have to put up with a few weeks of sticky drip until the sytemic fully moves throughout the tree. Should it be reapplied in the fall? That hasn't usually been necessary. But trees in heavily infested neighborhoods sometimes have minor outbreaks in the early fall leading to sticky leaf drop. If you have had this problem an August application could prevent it. Is there an organic alternative? Not for large trees. Spraying smaller trees with insecticidal soap will kill some aphids and rinse off the goop (actually, it is water soluble so just hosing it off will rinse it off). But with thousands of aphids present, surfaces will just be covered again within a day or so. Ultra-fine oil sprays will kill more aphids than soap, but spraying larger trees is impractical. Natural enemies give some level of control. Releasing ladybugs isn't effective, but you may see natural populations increase on untreated trees. The organic alternative, pretty much, is to tolerate the sticky drip. What if my neighbor doesn't treat? Aphids will fly from his tree to yours, feed, and die. It isn't likely to significantly increase the sticky mess you deal with, because they won't have time to reproduce. How toxic is imidacloprid and how does it work? The Caution label indicates the lowest level of pesticide toxicity. See the label's Precautionary Statements for specific hazards. Related to nicotine, imidacloprid kills the insect by interfering with a nerve pathway. It is more toxic to insects than to other animals. Imidacloprid is toxic to bees when sprayed, but much less so when applied as a soil drench. Don't apply any systemic insecticides to or near food-bearing plants unless they are specifically on the label. Imidacloprid is systemic in plantsi.e., it moves in through the roots and stems, up to the leaves in the sap of the plant where it is sucked out by aphids, scale, and other sucking insects. It also may kill some insects which bore through the sap into the trunk. 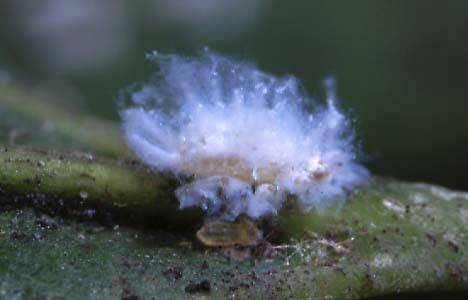 Here is the UC Davis pest management note on Asian Woolly Hackberry Aphid. Photos from the University of Florida Pest Alert notes.